US members of the Linear Collider Collaboration make plans for a new stage of industrialisation studies. With the publication of the Technical Design Report (TDR), one stage of design and costing for the ILC is complete. Now, US members of the Linear Collider Collaboration must consider what ILC components the US might contribute—and how they will be produced. By contracting with industry to consider details such as cost and facilities needed, US Linear Collider Collaboration (LCC) members hope to eventually be able to provide the Department of Energy (DOE) with a document containing specific suggestions for what unique contributions US labs and industry could provide to the future ILC. Producing such a document begins with industrialisation studies for specific components – such as a study of the SLAC-designed power distribution system that scientists hope to begin this year. Involving industry helps provide reliable cost estimates, determine facilities needed and drive further innovation. “This is an enormously important part of the project because it’s very easy for physicists to just sit in the ivory tower and dream up these numbers,” said Marc Ross, a SLAC physicist and member of the LCC’s ILC effort. 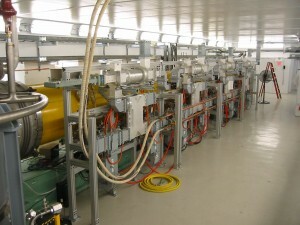 The SLAC-developed power distribution, or waveguide, system is one of the ILC technologies ready for an industrialisation study. A series of rectangular pipes running along the outside of ILC cryomodules, the waveguide system transports radiofrequency microwave power from the power supply to the accelerator’s cavities. This power accelerates particles to the collision point. Though companies that build similar systems for radar and long-distance telephone communication applications helped build a prototype system at SLAC, an industrialisation study will determine what would be necessary for a company to produce the system for the entire ILC. In addition, industrialisation studies can often also provide innovative, cost-effective changes to the initial design. “Hopefully the company (doing the study) would bring something to this other than just the cost: how to make this cheaper, how to make some of the parts as one as opposed to three, for example,” Adolphsen said. Though producing a single, more complicated part might require the development of a special machine to produce it, with industrial-scale production, making that machine may be more cost-effective than producing and fitting together many small parts. For example, the current design for SLAC’s waveguide distribution system requires a large number of flanges to connect various pieces, which is both expensive and time-consuming. Ross and Adolphsen hope an industrial partner could develop a way to weld or otherwise unify parts to reduce the number of flanges. The waveguide system study won’t be the first industrialisation study done for the ILC; the LCC commissioned companies based in Europe, Japan and the US to do similar industrialisation studies for the ILC’s cavities prior to the publication of the TDR. Industrialisation studies of ILC technologies like the waveguide system will continue to inform planning for the ILC.